The average household has seen no gains in their after-tax income since the end of 2010, as the economy was emerging from the global financial crisis. An analysis of living standards by the ANU’s Centre for Social Research and Methods shows the fall in the past three years was greater than during the last recession in 1991-92. …living standards peaked in 2011. There was no improvement for the next four years, but incomes started falling behind rising living costs from late 2015 onwards. The below charts from the National Accounts confirms the picture painted by ANU. 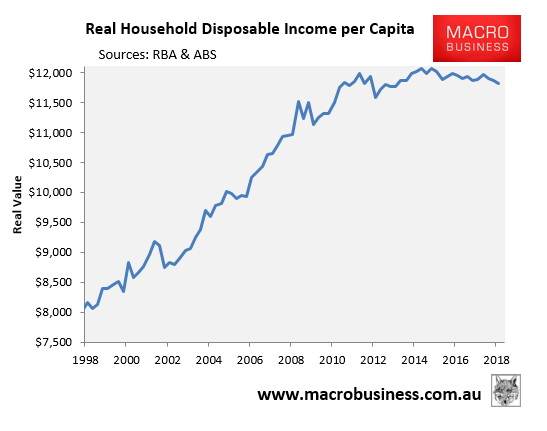 The decline in real household income helps to explain why MB is so pessimistic on household consumption, which accounts for around 55% of Australia’s domestic demand. However, the drawing down of savings is clearly unsustainable, and at some point soon, this process will have to stop or go into reverse. 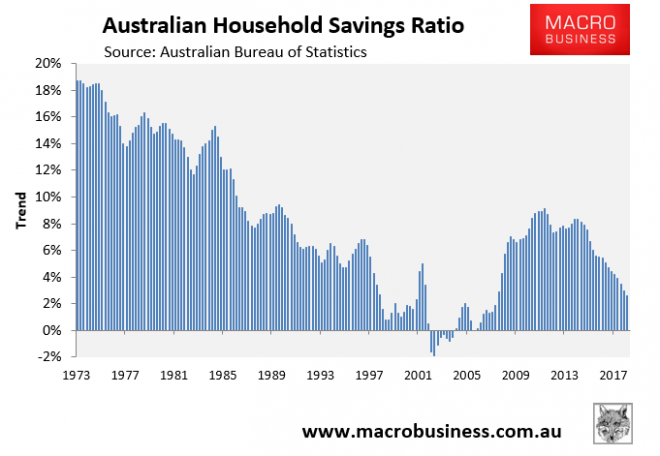 In fact, with Australia’s housing market now plummeting alongside household wealth, the savings rate will very likely begin to rise. And this process will necessarily dampen consumption. The Australian consumer is on life support. Sounds like we need more immigrants to boost wages. More like boost total wages, not wages per person. That way we manage to apply both quantitative and qualitative easing. It’s astounding how the MSM doesn’t take this free kick response whenever Scummo talks about “keeping” the economy strong. 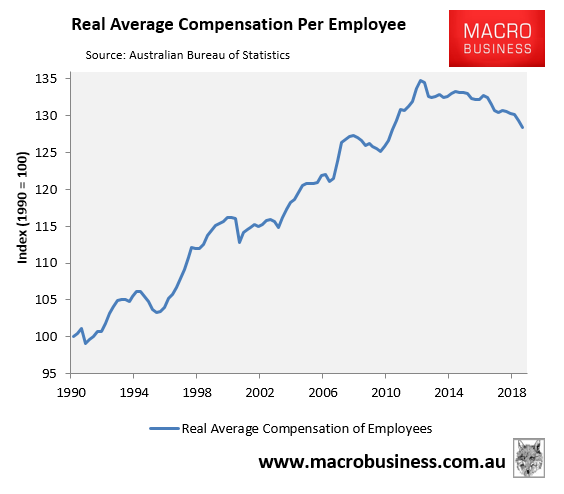 Neoliberalism pushing for the well protected, well paid Australian labour market to reach equilibrium with the poorly protected, lower paid international labour market would lead to poorer protection and lower pay for Australian workers…..whoocoodanode? What the LNP want us to do is all start small businesses employing foreign workers on wage rates below award and get RIIIIICH. Not sure what we’d do with said foreign workers. We can’t all be baristas can we? Someone has to drink the coffee.